Everyone needs beer cheese soup in their lives during the chilly winter months. Great as a weeknight meal or game day snack, this soup is a true bowl of comfort. It has a few simple ingredients, but you can also easily spice it up by adding bacon, chorizo, or hot sauce. 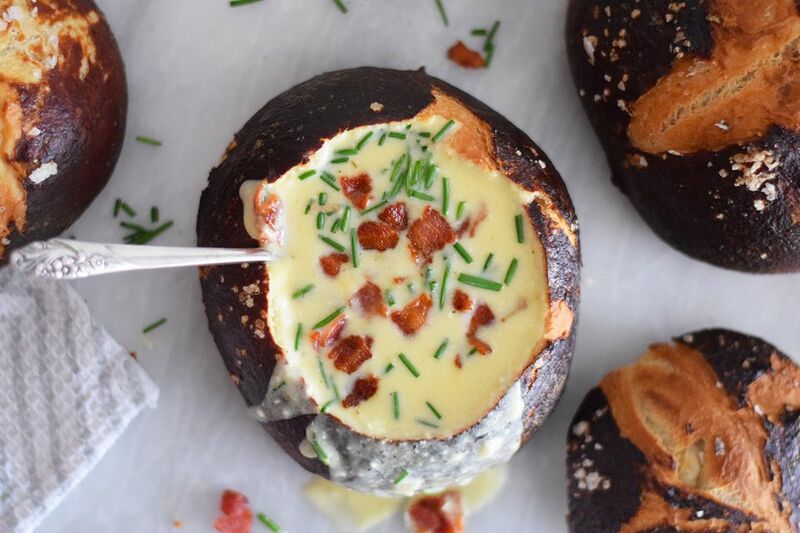 The soup is cozy, creamy, and decadent, especially when you serve it in a pretzel bread bowl. With its thick and velvety texture, beer cheese soup is perfect for dipping—it's almost like enjoying a queso! Add the butter to a medium heavy-bottomed pot. Allow the butter to melt over medium heat and add the chopped carrots, celery, onion, and garlic. Add a teaspoon of salt and saute the vegetables on medium heat until they are softened and slightly browned, about 10 minutes. Add the chicken broth and thyme to the vegetables and pour it all into a blender and blend until smooth. Pour the mixture back into the pot and add the beer. Heat on medium heat, whisking to incorporate the beer. Add the half and half and softened cream cheese and gently whisk into the soup. Make sure the cream cheese is softened; it will incorporate into the soup more smoothly this way. Toss the shredded cheddar with the cornstarch until the cheese is coated evenly. Add one handful of cheese at a time, whisking it into the soup until it is melted and incorporated. If you add too much at one time, it can become clumpy, so do this slowly. Simmer for another five minutes until it has thickened, stirring frequently. Season the soup with more salt as needed and add the pepper. If you want the soup even smoother you can pass it through a sieve or add it back to the blender and blend again. Serve the soup in hollowed out pretzel bread bowls or regular bread bowls. You can also serve in a plain old bowl with some delicious bread or pretzel sticks! Top with the chopped chives and bacon. Do not use pre-shredded cheese for this recipe. The bagged cheeses contain anti-caking agents that can make the texture of the soup grainy. Use a variety of cheddars, varying from sweet to aged to smoked. This will create a complex and sophisticated flavor for the soup. Make sure they are high-quality cheeses for the best flavor. Lagers and Pilsners work best for this soup, however you can also use other varieties. Make sure to choose a beer that you enjoy drinking as you will taste the flavor in the soup. You can use stronger beers like pale ales, but only if you really enjoy them and are ready for a very strong beer cheese soup. Add chorizo to the pan before you saute the vegetables. Remove the chorizo from the pan once it has browned and then saute the vegetables in the same pan. Incorporate a little smoked paprika when you add the time for a smokier tasting soup. Make it vegetarian by replacing the chicken broth with vegetable broth and omit the bacon at the end.